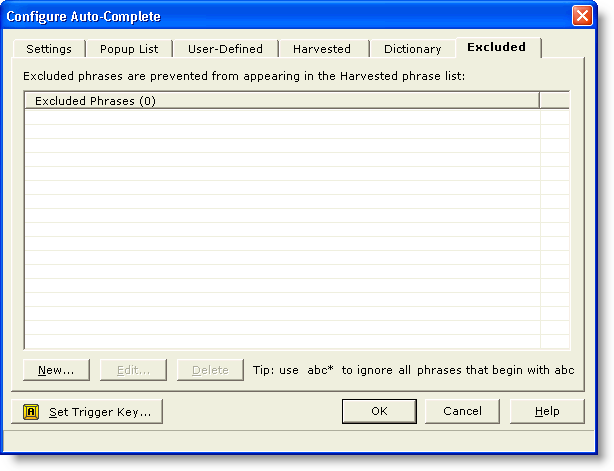 The Excluded tab of the Configure Auto-Complete dialog can be used to view or edit the Excluded word list. Words that appear in the Excluded word list will never appear in the popup list of matching words, even though they might otherwise be eligible to appear there. If you find that a certain word is being suggested for completion, and you find its presence in the popup list to be bothersome, simply add that word to the Excluded word list. Use the New button to add a word to the Excluded word list. You can use a string of the form abc* to cause all phrases beginning with abc to be excluded. Use the Edit button to edit an existing word in the list. Use the Delete button to delete a word from the list.